The amount of hemp oil Dr. Bronner's buys from Canada annually to make their soaps. Remember that hippie kid in college whose room always smelled like patchouli? He may not have showered regularly but when he did, he likely used Dr. Bronner's. But don't let that dissuade you from the hemp-infused "magic soap." It turns out, he might've been onto something. 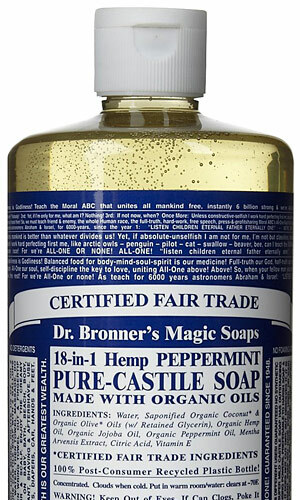 The venerable Dr. Bronner's brand has been churning our its signature all-in-one cleanser for more than six decades. Certified organic and fair trade, the soap is made in America and packaged in a 100% recycled plastic bottle. It comes in seven scents, but we prefer the peppermint which is perfect for waking you up in the morning. There are no harsh detergents or foaming agents—in fact you could count all ingredients on your hands. What's more, you can use the stuff to clean pretty much anything—from your hair, body and teeth to your jeans to your furniture to your dog. The olive-oil-based cleanser softens water as well as skin. It dissolves dirt and washes away without leaving a sticky film. A little goes a long way, which makes it even more of a bargain. After all, "what's from the Earth is of the greatest worth."